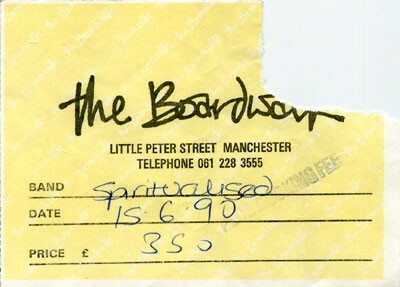 A ticket for Spiritualized on their first tour. This was something of a chilled out gig, everyone sat on the floor. Something changed though soon after and the next few times I saw them they got more and more intense each time. This particular first tour was also mainly the reason that Spacemen 3 split up, or at least the final straw. It was advertised as Spacemen 3 minus Sonic Boom, which it was as the entire band was present, and this somewhat annoyed Sonic and deepened the rift. were they supported by the darkside at this gig? if so this was where the darkside's singer spent most of the gig telling me about how he spends his time taking heroin with sonic boom... he was very boring but their first single was a cracker! I love their "ladies and gentleman we are floating in space" cd in its packaging like a packet of tablets including the cd wrapped in foil and full user instructions. One of the best things ever done with the limitations of cd packaging. Over the years though this wonderful bit of packaging just turns to crap, and you end up with a flimsy, creased up bit of cardboard and foil. Also, if you open it, you ruin it instantly. Hmmm...Darkside 'singer'? A very boring man indeed...he's just discovered Punk, or so I'm led to believe...ha!